Ever fished a “cripple” fly pattern? It might seem the odd man out in your fly box until you find a pod of trout that have keyed in only on emerging Baetis that haven’t escaped their shucks. 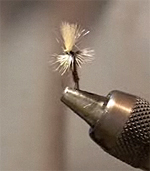 In this week’s new fly tying video, Michael Yelton ties a Pheasant Tail Cripple, a great all-around pre- and post-hatch pattern.